“All you need is one good rug!!”. I met Susan Gomersall of Kea Kilim over 20 years ago. My entire tribal rug collection has been purchased from her over these years. I would not think of buying one somewhere else. In the early days, I could not afford them and would have to make payments over time. I adore living with these rugs in my home; sometimes changing them out for the season; dark ones in winter and light ones in summer. My collection brings me a deep satisfaction and sense of well- being. I know that each and every one was handmade and often dream about the creator. In my dining room, I layer them, one over the other, Bedouin style. Each one is unique. Each one was woven with an individual vision, although the cultural and stylistic traditions are very apparent. Rugs are a currency. Given the state of the investment world, I can tell you that my rug collection has appreciated for more consistently than any stock or bond. Imagine that you actually live with these beauties at hand in your home while they appreciate in value every year. How can you beat that? Susan is British but left England in 1971. She was studying ancient stone carvings in the Middle East. Living with Kurdish nomads, she never returned home. 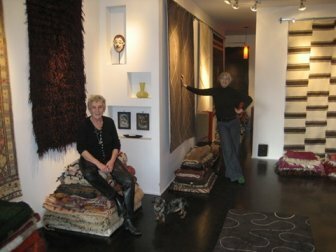 Instead she traveled throughout Asia buying and trading rugs for the next 15 years. Let’s cut to the chase: she’s an expert with a passion that is evident the moment she begins to speak on the subject. Her partner in life and crime is Azy Schecter. They met around 2001 and went into business together. Azy is a contemporary rug designer and works with architects and designers on private and corporate projects. Her water color drawings of new designs are collectible in and of themselves. The combination of these two women, as well as the combination of old and new, is unbeatable and totally unique in this world. Their store on Atlantic Avenue in Brooklyn is the best of the best; I cannot visit there without sticking around for hours, many times leaving with a new rug. Unlike most rug galleries, you will not feel in the least bit intimidated. Both women are generous of heart and spirit and take great pleasure in introducing you to their world.